It’s Super Bowl Sunday at the Almost Home Bar and Grill with the hometown Broncos playing for their second championship in a row, and the already busy night is about to get busier. When the bartender walks off, she leaves the remaining staff to the chaos of the night—and with the real question. Not why did she leave but why do they stay? After closing time and on a school night, Colleen’s 14-year-old daughter is no stranger to the Almost Home. She’ll do almost anything to leave, to move her life forward or somehow return to earlier, better times, anywhere but here. But it doesn’t matter; there seems to be no way out. For one night, we follow all of them as they make their cash, close up, and then linger into the after hours, as they always do, their lives colliding, past and present, in the dark back corner at table 14—drinking, talking, and, now, in the wake of Marna’s absence, facing questions: Where did she go? Will she return? Why do we stay? How dangerous is restaurant love? 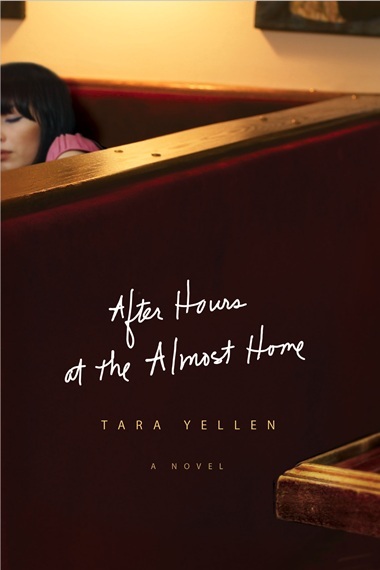 Smart, provocative, and flawlessly on target, Tara Yellen’s revealing debut offers keen insights on a group of people left to put the pieces of their own lives back together in the wake of a friend’s disappearance. After Hours at the Almost Home will put you in an altered state—it’s got kick and goes down like a shot. But its effects might be far more lasting. It was 1:15, a half-hour before last call—a half-hour before Lily. Only the bar itself was still crowded, and even there things were winding down, everyone paid up, people hovering more than anything else, making halfhearted attempts at complaining and debating—the Broncos, John Elway, the previous year’s Senate race, the wrestler-turned-governor—all of it falling away as people left, first in a rush and then one by one, so that the TVs, too loud now, made the most convincing arguments of all, about dish soap and beer and replayed newscasts of the downtown celebrations. Police scattering crowds. One TV was turned to a cooking show, the chef folding something pink into something yellow. Gently, gently, his voice warbled, and Denny reached up and flicked off the volume. He was working up a sweat at the sink, washing the glassware that JJ was collecting for him. She swooped back and forth between the tables in a wild sort of dance. The place was a disaster, of course—a couple overturned chairs, used napkins and dirty plates everywhere—but it was nothing the usual sweep-through wouldn’t fix. Glassware then plates then garbage then Windex. Then taking out the garbage and restocking. Every night, the same routine. It was always doable, Colleen reminded herself. It never seemed doable, but it always was, when you broke it down.